We are delighted to announce the launch of DataShine Scotland! Using data from Scotland’s Census 2011, we have mapped over 1000 metrics (covering 70 topics) for Scotland’s 46,351 census output areas. While many of Scotland’s Census questions (and the resulting data) were harmonised with the England/Wales census (mapped here), there are some differences. For example DataShine Scotland maps Gaelic-speakers, those who stated their religion as Church of Scotland, and provides Travel to Study data. We have also included some additional metrics, such as the distance travelled to work. The website is based on the DataShine platform so it offers the same functionality as our England and Wales mapping (including PDF map export and custom colour palettes), but with a number of customisations like quick links to a selection of eight Scottish cities (these appear in the panel at the bottom of the website). We’ve added a few innovations too, such as using specimen postcodes to identify a “real world” name for each output area. The selected census data on each area, and its specimen postcode, are displayed automatically when “mousing over” the map. We have also taken the opportunity to slightly simplify the user interface, allowing the map itself to continue to be the dominant feature of the website. The website takes full advantage of the DataShine “look”, with the census choropleth maps shining through the detailed building shapes across the country. Roads, railways, rivers and seas, along with area labels, are then added for context. The Ordnance Survey has provided the building shapes and other geographical detail that we use, through their Open Data suite of products. 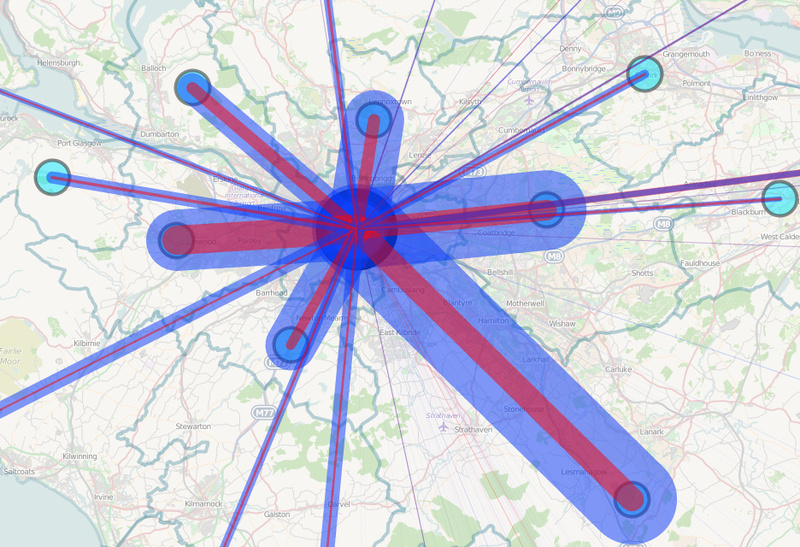 We are additionally now launching DataShine Scotland Commute. This website maps the travel-to-work flows between the 32 council areas of Scotland as well as to/from England/Wales (see here for the within England/Wales flows). The flows can be split out by 10 different modes of transport. We hope to include finer-grained commuting patterns for Scotland, should the relevant metrics become available in the future. DataShine Scotland and Scotland Commute were part-funded by National Records of Scotland (NRS) in consultation with Scotland’s Census. Further information about DataShine Scotland and DataShine Scotland Commute can be found on our dedicated page and we welcome feedback via our comments page. Images: Top – Just under 5% of journeys to work in Edinburgh by bicycle. DataShine Scotland highlights the areas where those people live. Middle – A view of the dynamic colour ramp and constantly updating metadata display, in the Key panel. Bottom – The volume of commutes into, and out of, Glasgow, from neighbouring council areas. DataShine Scotland, and the screenshots here, include imagery that is CC-By OpenStreetMap contributors, Crown Copyright and Database right Ordnance Survey, and Crown Copyright National Records of Scotland. about purchasing our adult social signal package. search rankings online if you’re a adult material website internet marketer. This will really help get Census out there. One query. I tried the data download and received Ward level data when the data I was viewing on the map was OA level. Is there any way to download the OA data? And might there be an ability to change the geography to datazone or similar?